Apple CEO Tim Cook this afternoon spoke about the tariffs the United States has imposed on goods imported from China, and how Apple might be impacted. 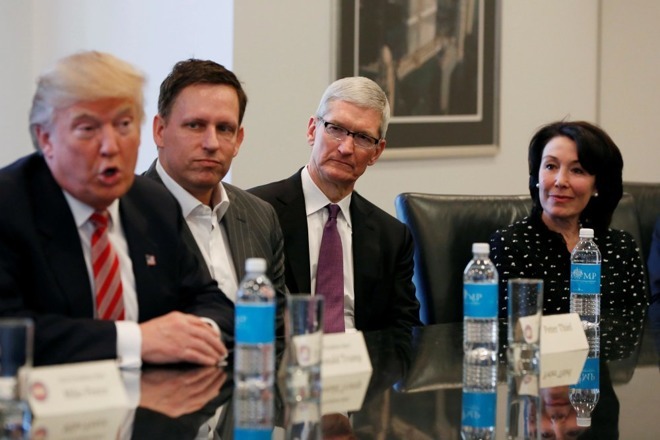 Cook said that while Apple believes the trade agreements the United States has with other major economies are in need of modernization, the company does not think that tariffs are the right approach. "We're sort of encouraging dialogue and so forth," said Cook. In terms of the three tariffs that have already been put in place that impact steel, aluminum, and $50B worth of additional goods from China, none of Apple's products have been directly impacted. A fourth tariff on $200 billion in Chinese goods is out for public comment, and Apple says it is evaluating the tariff and will be sharing its views on it with the administration before the end of the comment period. The original Apple Watch has been named in the latest proposal, alongside devices that include the Fitbit charge and some Sonos speakers. Apple has already discontinued its original Apple Watch and newer Apple Watch models are not impacted. Cook said that examining tariffs is a "tedious process" because there are factors to consider that include not only revenue, but also purchases being made through other companies unrelated to revenue, such as data centers. Apple plans to share its results at a later date. According to Cook, the risk associated with a macroeconomic issue like an economic slowdown or currency fluctuation is difficult to quantify, and that's not something Apple is trying to do. Cook said that Apple is "optimistic" that the tariff issue will get sorted out. "There's an inescapability of mutuality between the United States and China," said Cook. "Each country can only prosper if the other does... and the world needs the U.S. to and China to prosper." Cook said that while he can't predict the future, he's "optimistic" that the countries will get through this. "We're hoping that calm heads prevail," said Cook. It’s funny that you think Trump is stupid. When you look back at EVERYTHING he had done, it’s very easy to see the calculated and precise moves he makes. When he looks “stupid and impulsive”, you should be looking for the other moves he is making in the background. It’s very interesting. But muh, the media tells me to be mad at Drumpf so I’m going to be mad. "We're hoping...... He's not as stupid and impulsive as he is....."
As a CEO he is more concerned about short term profits than our national security, which is fine because he is a CEO. However confronting China's unfair trade practices (one-sided protectionism) and intellectual property theft should be a bipartisan issue, despite the fact that the current administration deserves to be impeached. China is profitting at our expense, being able to flood our markets with crap pushing local manufacturers out of business, while they refuse to buy most of our products in favor of protecting domestic industries, and while Americans can't even open an icecream stand in Beijing without forming a 51% Chinese 49% American joint venture and giving up all of our intellectual property. If he's waiting for Trump to have a "calm head" - he's going to be waiting... a very long long long time. He’s done more in 2 years than 44 did in 8. There's a chance the bull will calmly walk out of the china shop. Oh ****, there's someone wearing red. Bow to your Chinese overlords Mr Cook. Sick of our CEOs selling the US out to China via technology transfers and IP. Name one brilliant maneuver Trump has made. He inherited a roaring economy from Obama and stoked the fire with tax cuts for corporations and the rich. That’s pretty much it so far, and it’s not very brilliant. Oh he also “solved” the immigration issue by kidnapping thousands of very young children and traumatizing them for life, then got slapped on the wrist by the judiciary. He has repeatedly bellowed “no collusion” like the demented cow he is, only to change his tune to “collusion is not a crime” (even though it is in this case) as investigators close in. He’s a moron and he hasn’t made a single brilliant move.